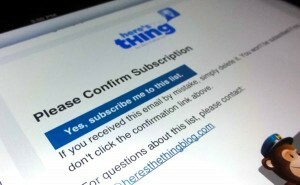 You’re just one step away from subscribing to the here’s the thing daily tips newsletter—and from entering our Kindle Fire HDX giveaway*! All we need to do now is confirm your email address. To complete the subscription process, check your email inbox, then click the link in the email message we just sent you. *We’re giving away a new, 7-inch Kindle Fire HDX tablet. All you have to do to enter is subscribe to our daily tips newsletter. Click here for the official rules.